Over the next several months, I would like to take a look at one of the artist signature guitars Gibson offered in the ‘60s, and more importantly, the work of the artist whose name it bears: Barney Kessel. Both the artist and guitar seem to be given scant attention, especially considering the contributions Barney made to the evolution of jazz guitar performance. Early on in his career, Barney was thought to have been the heir to the throne that Charlie Christian had occupied in the ‘40s. In the ‘50s, no one was as famous on jazz guitar or as prolific as Barney, no one won as many Down Beat artist polls, and no one was more in demand as the preeminent guitar sideman. The number of recordings that bear his name, both as a sideman and a leader, is staggering. Gibson first approached Barney in 1960, at the zenith of his popularity. Barney’s name had already appeared on several Kay models, but he was eager to attach his name to an instrument he saw as both more worthy and playable. “I don’t play that Kay – it’s a terrible guitar!” Mr. Kessel has been quoted as saying, although it is unclear if Barney was much happier with the new Gibson-made Barney Kessel models. While there are plenty of glamour shots of Barney playing both Custom and Regular models, all of his serious concert and combo recording work was done with a 1940s Gibson ES-350, sporting a Charlie Christian pickup. During Barney’s seemingly turbulent years with Gibson, the headstock logo was often seen covered in tape. While Barney often indicated a lack of interest in his own signature models, Gibson reached greater synchronicity with other artists, particularly Tal Farlow and Johnny Smith. Both Tal and Johnny showed serious interest in their models, and were rarely seen playing without them. It seems odd then that Barney was one of the few artists given two models, despite his seeming dissatisfaction with Gibson. His involvement with the actual design of the instrument has also come into question, with some suggestion that his signature model was a pre-existing design in search of an artist endorsement. This theory would indicate that Gibson was more eager to associate the guitar with a successful artist’s name than that artists actual input regarding the guitar’s design. Sadly, the ‘60s brought with it the slow death of popular jazz. Gibson – not then seen as a trendsetter – introduced the Barney Kessel model as the tide was beginning to turn toward solidbody electric guitars and rock music, with these changes helping to push jazz to the rear of the pop music bus. The Barney Kessel artist model was introduced in 1961, and actually stayed on the books for a staggering 13 years. 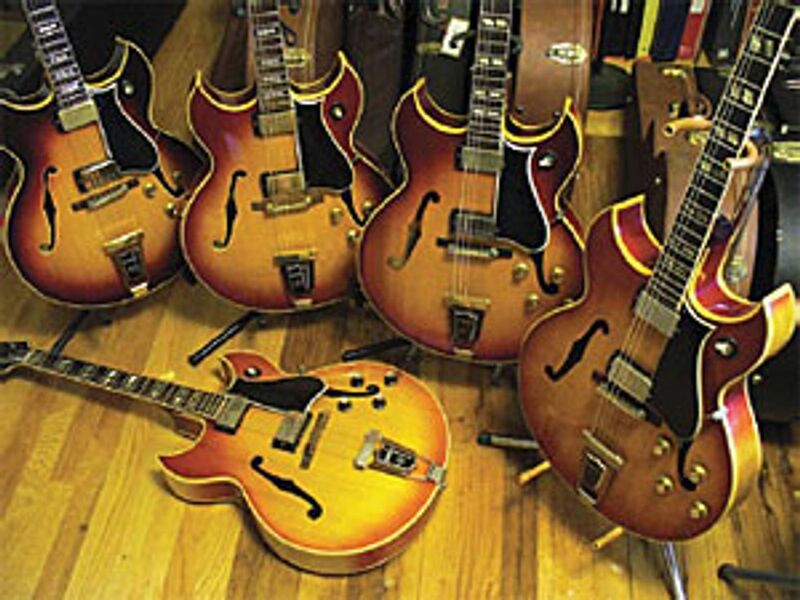 The model had a long but unsteady tenure with Gibson, with shipping numbers during its best year – 1968 – totaling only 371 units for both the Regular and Custom models. The model was phased out in 1974 as both Barney’s relationship with Gibson, and the popularity of jazz in general, continued to deteriorate. From my observation, today’s lack of popularity for the instrument is due, more than anything else, to the double cutaway design. Many of the model’s high end features, such as the Super 400 neck and headstock, tend to get overlooked. Over the last few years the Barney Kessel models have gradually increased in value. Sadly, since the individual parts are still worth more than a complete guitar, one often finds empty BK shells at bargain prices, with the original parts having been reappropriated to guitars deemed to be more worthy. I wonder if the dealers who part out the Barney Kessel guitars have ever listened to his music! Several of the Kessels in my personal collection were purchased as “wood only” and restored exactly as they would have come from the factory. We will know that the BK has arrived as a respectable collector’s guitar when the whole is worth more than the parts as has already happened to other previously less desirable guitars, such as the 1959 ES-175. Pictured are five BK Custom and Regular guitars, spanning 1961-1965. All original, these models boast ten PAF pickups among them. Next moth we will begin looking closely at this namesake artist himself and his contributions to chordal bebop lines. A clinician and jazz educator, Jim Bastian is a 10 year veteran of teaching guitar in higher education. Jim holds two masters degrees and has published 6 jazz studies texts, including the best-selling How to Play Chordal Bebop Lines, for Guitar (available from Jamey Aebersold). He actively performs on both guitar and bass on the East Coast. An avid collector and trader in the vintage market, you can visit Jim’s store at premierguitar. (dealer: IslandFunhouse).